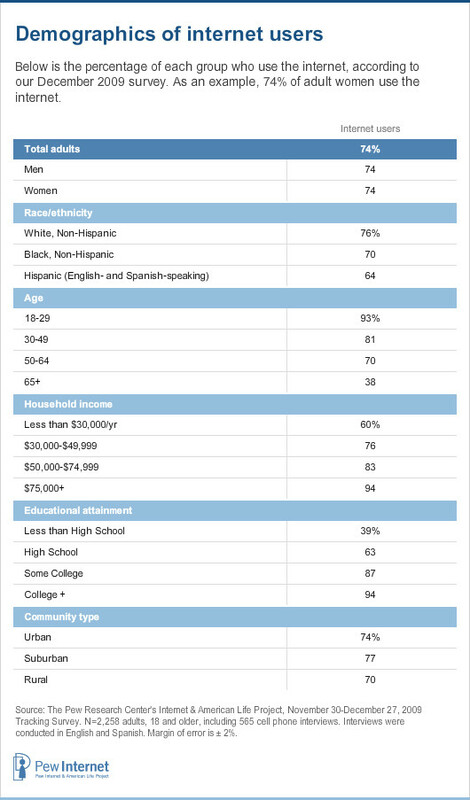 74% of American adults (ages 18 and older) use the internet — a slight drop from our survey in April 2009, which did not include Spanish interviews. At that time we found that 79% of English-speaking adults use the internet. 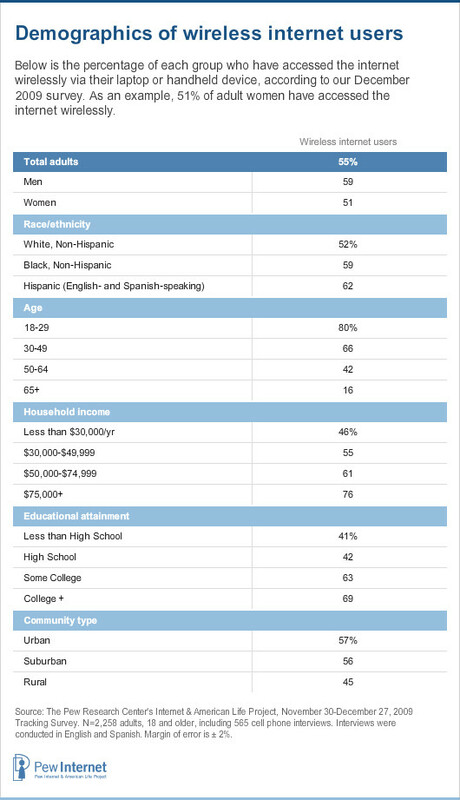 60% of American adults use broadband connections at home – a drop that is within the margin of error from 63% in April 2009. 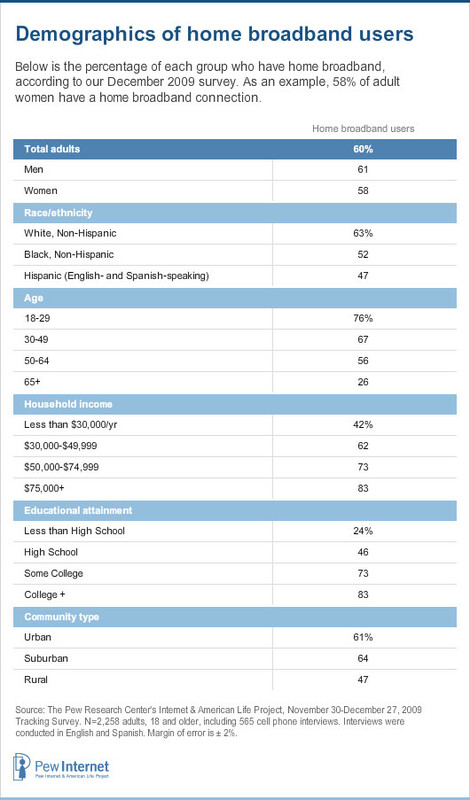 55% of American adults connect to the internet wirelessly, either through a WiFi or WiMax connection via their laptops or through their handheld device like a smart phone. This figure did not change in a statistically significant way during 2009. These data come from the Pew Research Center’s Internet & American Life Project. The most recent survey was conducted from November 30 to December 27, 2009, using landline and cell phones and including interviews in Spanish. Some 2,258 adults were interviewed and the overall sample has a margin of error of ± 2 percentage points. 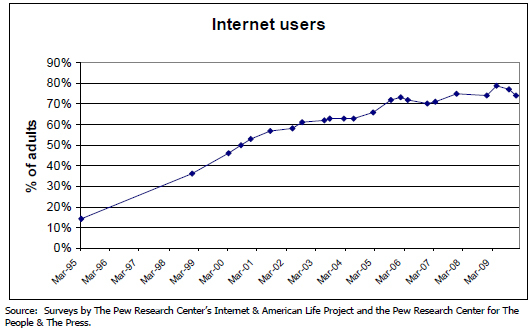 These latest figures add to a long-term picture in Pew Internet Project data that there has been little significant growth in the overall internet user population since 2006. 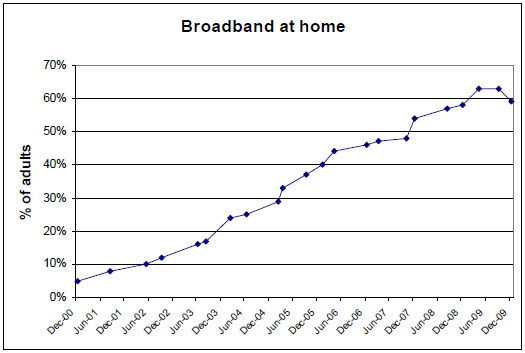 Broadband use at home has risen fairly consistently since the Pew Internet Project began to measure it in 2000, but growth rate has slowed somewhat in the general population.